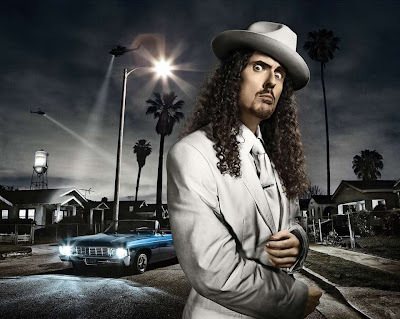 “Weird Al” Yankovic is one of the smartest men in music. Think about it. How many other wannabe jokesters have tried to do exactly what he does? And how many have even achieved one-tenth of his success? Everyone feels like they have a hilarious parody up their sleeves – in middle school my friend had a food-themed version of the Backstreet Boys’ “I Want It That Way” that never failed to kill us – but Al has taken the genre to another level. The guy’s been around for thirty years and he still sells out concerts coast to coast. Pretty good for a funny-haired accordion-player. Covering a parody seems somewhat counter-intuitive. The parody is the evil twin of the cover. A good cover keeps the lyrics but changes the music. A parody does just the opposite. So it’s not surprising that most of the fifteen (!) covers below are of Al’s original songs. I’ve long wanted to compile this post for Cover Me. I believe it’s worth the wait. Oh, and later this week I’ll be posting some covers that didn’t make this post on Twitter, so follow Cover Me now!